Rynek Glowny Market Place, Krakow. Street sellers on cobblestone laneways alongside modern restaurants and hotels. Welcome to the city of old and new. By Tim Richards. I’m sitting outside a restaurant on Kraków’s Plac Matejki, with medieval history acting as bookends to the long, narrow plaza. Directly across from my glass of chilled Polish lager is the Grunwald Monument, an imposing set of statuary topped by King Władysław II Jagiełło on a horse. Way back in 1410, the armies of this noble gent defeated the German Teutonic Knights, and Poland is not about to forget it. To the left of my cutlery, across a busy road bearing cars and trams, is the massive 1498 Barbican. This red-brick fortification once jutted out from the medieval city’s walls, protecting the Old Town’s main gate. In Central European style, it’s also rather pretty, with turrets bearing narrow spires green with verdigris. Between the beer and silverware, right under my nose, is a plate bearing potatoes and two types of cabbage (red and white). If there was also pork on the plate, this would be a quintessential Polish meal those medieval knights would have recognised. But times are changing in Poland, and the main feature of my lunch is a pair of vegetable patties with a dash of curry spice. The restaurant, Glonojad (Plac Matejki 2), couldn’t be a better symbol of modern Kraków. It’s a contemporary light-filled space, dishing up vegetarian food with an Asian edge along with free wi-fi. Its cheerful staff are bilingual young Poles for whom the communist era is just a cautionary tale told by their parents, and who have likely travelled across Europe and beyond. They’re a symbol of Poland’s changing fortunes since the end of the Cold War, when the nation’s second-largest city and former royal capital threw open its gates to foreign visitors. The Old Town is the key tourist zone, a unique collection of cobblestone streets, graceful facades and the Rynek Główny, the largest market square in Europe. At its southern end isWawel Castle, a mighty walled complex. Once the home of Poland’s kings, it offers a number of attractions, such as the lavishly-decorated State Rooms and Royal Apartments. Nearby is Kazimierz, once the home of a thriving Jewish community which was destroyed in the German-run death camps of World War II. Featured in the movie Schindler’s List, it’s hosted a revival of Jewish cuisine and culture in recent years. West of the Jewish heritage zone in Kazimierz, narrow streets are packed with tiny bars behind distressed facades. In the communist era this was a slum, but is now a cool nightlife district frequented by locals. It’s a good place for a drink night or day, so start from Plac Nowy and explore the neighbouring streets. Alchemia (ul Estery 5) has an artfully old-fashioned interior; Singer (ul Estery 20) is amusingly decked out with sewing machine tables; and Le Scandale (Plac Nowy 9) is the place for a bit of cocktail bling. you’ll see elements of everyday Polish life, including street side kiosks selling flowers or snacks. If you spot a kiosk marked cukiernia, stop and buy a pączek (a traditional jam-filled doughnut), then sit on a wooden bench in the square and people-watch. In the eastern part of Podgórze, the Schindler Factory (ul Lipowa 4) within Oskar Schindler’s original premises is a museum telling the story of the Nazi occupation of Kraków from 1939 to 1945. Those grim years, during which a German governor-general held sway over a lawless military zone, are brought to life via imaginative audiovisual presentations and oral testimony from survivors. It’s a gruelling journey, but deeply moving. Wrapping around the museum is the purpose-builtMuseumofContemporary Artin Kraków. Its collection of offbeat creativity is a welcome counterweight to the factory’s dark story. Hopping on an eastbound tram to the district of Nowa Huta is like setting a time machine’s controls for 1955. This steelworks suburb was intended to be a ‘workers paradise’ by its communist designers. Ironically, its residents joined the workers’ revolt which eventually overthrew the regime at the end of the 1980s. It’s a fascinating place to stroll, with enormous concrete housing blocks stretching from Plac Centralny, which once held a statue of Lenin. A great place to finish a visit is the modernistArkaPanaChurch(ul Obrońców Krzyża 1), built in the 1970s after unceasing pressure from locals. If you really want bragging rights, visit all four of Kraków’s memorial mounds. These artificial hills were created in memory of legendary heroes. Two are named after historic figures – the Piłsudski Mound (Al do Kopca) remembers Poland’s interwar leader, and the Kościuszko Mound (Al Waszyngtona 1) honours the great 18th century military hero who coincidentally gave his name to Australia’s highest mountain. The two less-visited mounds are wreathed in legend. The Wanda Mound (ul Mogilski) takes its name from a mythical princess who saved Kraków from invasion by sacrificing her life; while the Krakus Mound (ul Maryewskiego) is said to be named after the prince who founded the city by defeating a dragon. One way to reach Kraków is via a flight from a European hub such as Frankfurt on Polish national carrier LOT, or from London via budget airlines Ryanair or EasyJet. 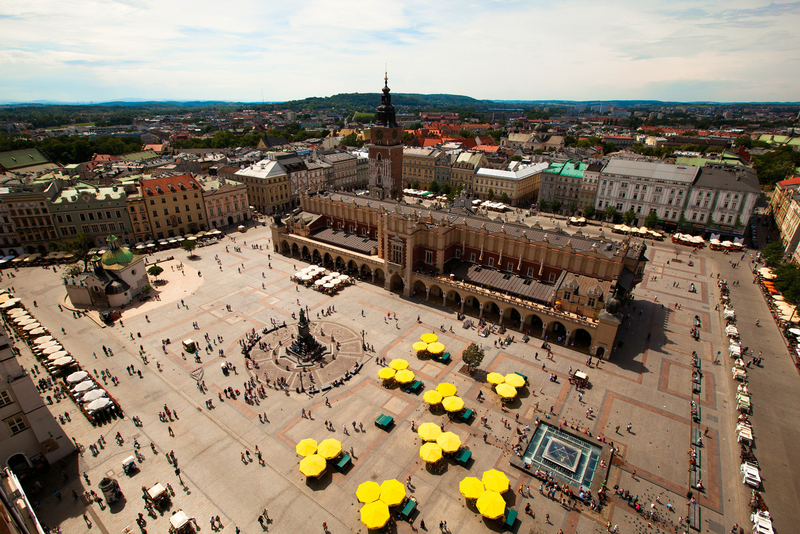 A Kraków return fare starts from $1700. From early 2013 Emirates will offer a more direct alternative from Australia via Dubai and Warsaw. Between May and October. Summer is pleasantly warm (and sometimes surprisingly hot). AAA Kraków Apartments offer comfortable apartments in the Old Town, complete with kitchens, cable TV and wifi. The most convenient are within Venetian House, just off the main square. From $70 per night. +48 12 346 4670. Hotel Stary. Posh lodgings in a renovated former mansion. With rooms decked out in rich cloth, marble and timber, and with upmarket restaurants and a rooftop bar, it’s a luxurious place to hang your kapelusz. From $270 per night. Ul Szczepańska 5. +48 12 384 0808. Gruszką Nova. A secret right under tourists’ noses, this eatery was long associated with a journalists’ club. It turns out tasty classic Polish dishes in an old-fashioned interior which is heavy on lace and dark timber. Ul Szczepańska 1. +48 12 346 5704. Wentzl. Housed in a 17th century tenement building, this restaurant owned by celebrity chef Magda Gessler serves high-end Polish cuisine with top-notch service. The strong Australian dollar means its main courses cost no more than $25, so it’s an opportunity not to be missed. Rynek Główny 19. +48 12 429 5299. Kraków’s appeal isn’t confined to particular buildings or monuments. The entire Old Town is a harmonious place to wander, and back streets can reveal as much beauty as the main square. The city has long been a popular destination for British stag parties, to the consternation of locals, though they tend to stick to the more obvious boozy pubs. Where to lap up luxury in Fiji for under $250 and more! I spent 4 days in Krakow in July of 1995.It is a fascinating city,the city I enjoyed the most in my 3 week tour of Poland.Once you arrive in the large town square,there are many narrow streets,with inetersting places to visit.Surrounding the old city are the gardens,that circle it.Small and compact as it is,means it is a great place to walk here and there at your leisure.Of all the places I went to in Poland,this city seemed the happiest place of all.This city is also close to the mountains of Zakopane and other interesting and historical places.Anyone visiting Poland,should put this city on the top of their list of places to visit.